Real Betis and manager Quique Setién injected a sense of excitement and life into LaLiga last term, finishing sixth in the table with an entertaining brand of attacking football. This was bound to be a difficult achievement to repeat, especially with the added responsibility of the UEFA Europa League. However, few would have expected such a muted start to the 2018-19 campaign for Los Verdiblancos. The summer brought several changes, and there was a concern in the middle of the line-up with the departure of Fabián for Napoli. Although, Betis gave their fans plenty to be hopeful about with their transfer business. Sergio Canales and Takashi Inui were added on free transfers, while a fee in the region of €20,000,000 saw the club land William Carvalho from Sporting CP. The 26-year-old brings a wealth of experience to Setién’s squad, having been a part of Portugal’s magical run to the Euro 2016 final. The promising midfielder Giovani Lo Celso was also signed on a season-long loan from Paris Saint-Germain. Changes at the goalkeeper position were on the horizon, as Pau López (RCD Espanyol) and Joel Robles (Everton) signed with Betis. However, much of the group’s core remained, and many were anxious to see how the club’s heart-pounding style of play would fare in Europe and beyond. Thus far, the results have been underwhelming. It all began with arguably the most surprising result of this young LaLiga season in the opening match of the campaign, hosting Levante at the Estadio Benito Villamarín. Enjoying almost 80 percent of the possession and registering more than 20 shots, Betis suffered a shocking 3-0 loss. José Luis Morales scored two goals, and the visitors took their chances well against a superior opponent. The front-line saw Loren, Ryad Boudebouz and Antonio Sanabria mostly struggle to find a finishing touch in the final third. New players were adjusting to Setién’s 3-5-2 formation, that features Carvalho as a holding midfielder in front of the back-line. Possession and passing were there, but those elements were simply not leading to genuine opportunities to open the scoring. It was easy to assume that this was something that could be addressed effectively in the coming weeks, but that has not necessarily been the case for Er Glorioso. In their first six games across all competitions, Betis have been held goal-less in four matches. They are currently 13th in the table, with just one win through five league fixtures. But, it is worth noting that the one victory provided fantastic motivation for what could be ahead. A thrilling 1-0 triumph arrived in Betis’ biggest encounter of the season, hosting Sevilla in the first Seville derby of the campaign. A very close encounter was winding down to its final nervy moments, when the captain made his presence known. Subbed on only five minutes earlier, Joaquín netted the winner in the 80th minute to send home supporters into an absolute frenzy. Born in Andalusia, he has come to define Betis during recent years with more than 300 appearances for the club. Now at the age of 37, he may not always be a starter, but his leadership and knowledge are at the highest of levels. And like he showed against Sevilla, Joaquín can still be counted on for important goals when needed. A match last week versus Athletic Club seemed to be keeping a down trend going for Setién’s team, as the visitors took an early 2-0 lead. It appeared that Los Verderones were set to crumble once more, that last season’s hashtag “#AlwaysWatchBetis” was something that no longer was in existence. But the second half showed why there is still plenty of hope along Spain’s south coast for this particular squad. Defender Marc Bartra found the first strike a few minutes into the second half with a beautiful long-range effort from 25 yards out. In the 68th minute, a sharp pass from Cristian Tello found Canales in the penalty area for the equaliser. 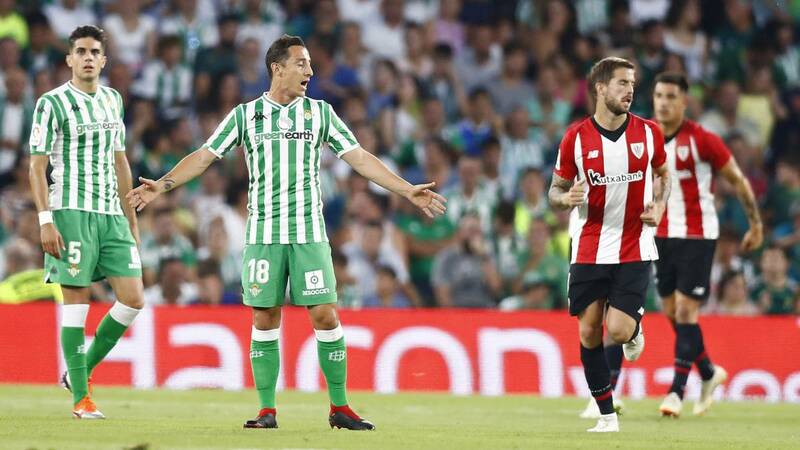 That fighting spirit is what will keep Betis in most matches, even if they have had a less-than-perfect beginning to 2018-19. The summer signings will continue to integrate into Setién’s plans, and will only become more comfortable with their surroundings and new tactics. Betis have a wonderful opportunity this week to earn crucial points and get back towards reaching top form. They travel to the Estadi Monilivi to face Girona on Thursday evening, before a home fixture against Leganés on Sunday. Two wins would significantly alter their place in LaLiga’s table. Real Betis garnered a tremendous amount of attention last season, creating rushes of adrenaline for almost anyone taking in their matches. This has not been witnessed often as of late. However, with the quality they have in the line-up and magnificent support behind them, there is reason to believe that disappointing results will not continue for very long. As their fans say: ¡Viva er Betis manqué pierda!